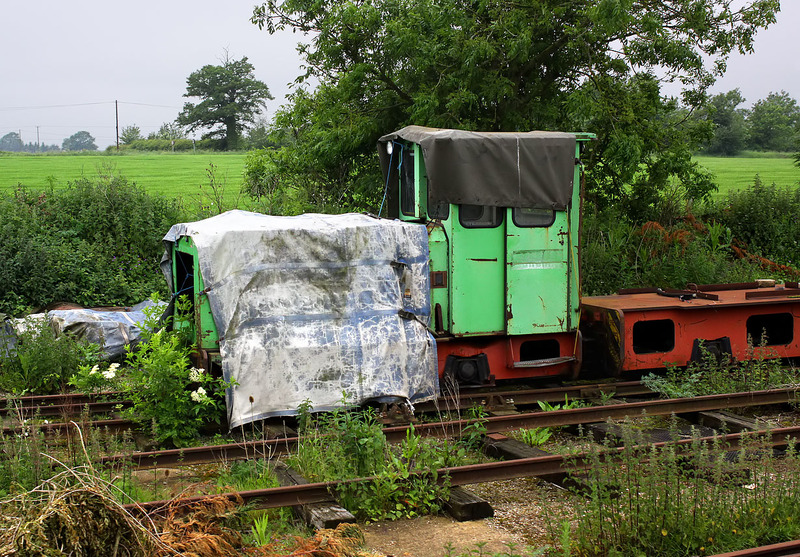 Formerly of the Swinefleet and Hatfield Moors peat railways, Schöma 0-4-0 5220 stands amongst the weeds in the yard of Hardingham station next to the Mid Norfolk Railway on 29 May 2014. Photo taken from the passing 13:45 Wymondham Abbey to Dereham DMU. Whilst in use at Hatfield the loco was named The Thomas Buck. The mark left by the removal of the nameplate can just be seen above the radiator. The name seems to have been transferred to sister loco 5130, which has been preserved as a static exhibit at the Hatfield Moors works.